Here are some questions people ask us all the time. Have a question that’s not asked or answered here? Feel free to give us a call at 412-281-0912 during office hours. On Saturdays – opening nights – some men like to wear a suit, and the ladies might step out in a special dress. But just wear whatever makes you feel comfortable. On weeknights people often show up in what they wore to the office that day, and on Fridays and Sundays, we see everything from dressy to jeans. This season, our single tickets start at just $14 each. Season tickets for the Benedum operas start at just $45! Click here to explore season ticket options. How can I understand what they're singing about? Easy! You can read the English texts projected above the stage, just like subtitles at the movies. You can also read the story ahead of time or come early enough to read it in your program book. Whether you prepare or not, you'll understand every word! How long will the opera be? About the same amount of time as a long movie. Most operas are between two and three hours, including intermissions. The shortest opera we know of is 13 minutes long, and the longest one takes 7 days! You can find the running time for each opera we present on its main website page, under "Details and Resources." What's a good show for opera newbies this season? We have several answers for this question. If you have to choose only one (we hope you don't - we have season tickets starting at $45! ), and you want the ultimate, classic opera experience, go with Madama Butterfly, La bohème, or Don Pasquale. 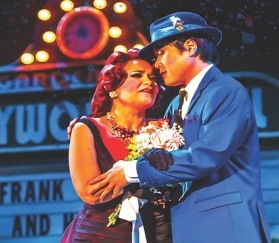 They've got famous, familiar music; fantastic casts, traditional sets and costumes, and, well, that grand-opera grandness that so many people love. You'll understand every word with the English texts projected above the stage. Is it OK to bring kids to the opera? Of course! Opera is fun for the whole family. We have kids who come to our student matinees and then make their parents come back so they can see the show again. The main thing is that your child should be able to sit quietly for long periods of time. Third or fourth graders are usually fine, but parents are the best judge. Kids do best if you prepare them in advance. Tell them the story of the opera, play some of the music, or watch a few videos on YouTube. Have your little Warhols and Cassatts draw pictures of their favorite characters or imagine what the set might be like. Be creative! Some operas – OK, most operas – have adult themes. Murder, revenge, lust – all that stuff that grown-ups find so interesting. 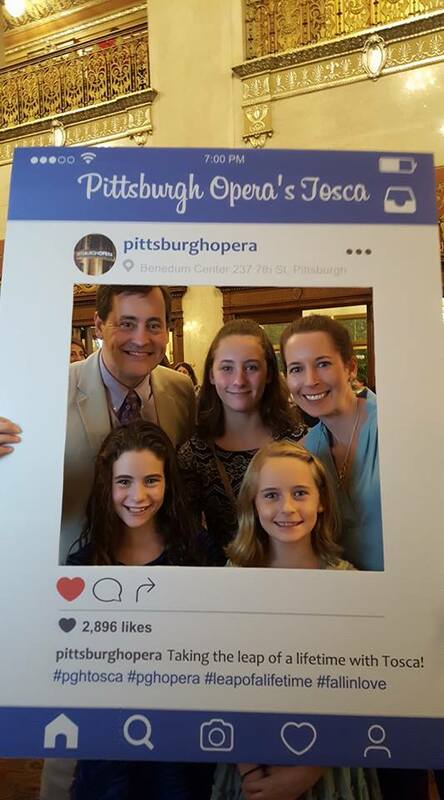 Visit our blog to read about Eleanor and Edith, two young ladies that are regular opera-goers and recently met Mark Delavan, star of Tosca, Rigoletto, and Nabucco. Is there any special etiquette I should know about? A little common courtesy is all you need. It probably bothers you when people talk and rattle their candy wrappers at the movies, or look at their phone screens, or show up late, or get up to go to the bathroom in the middle of the show. Same here. And if you’re not sure when to clap, just wait until everybody else does. If you really like what you hear, yell, “Bravo!” Or just cheer! Is Pittsburgh Opera still performing at the Benedum Center? Yes! Our mainstage productions are at the Benedum Center. The Resident Artist production of afterWARds - Mozart's Idomeneo Reimagined will be at CAPA Theater, and Glory Denied will be performed in the George R. White Studio at Pittsburgh Opera Headquarters. If you’ve heard about a change of location, that’s because our headquarters is at 2425 Liberty Avenue in the Strip District. You can visit us here to see free Brown Bag Concerts on selected Saturdays of each month at noon, October - April, and for other great programs like Art Song Recitals, Opera Up Close and education programs. Come see us! There is free parking on nearby streets, as well as a paid surface lot next to the Harp & Fiddle on Penn Avenue between 24th and 25th Streets. Can I park near the theater? Here's information about parking near each of our performance venues. The closest parking is right across the street from the Benedum Center, at the big blue Theater Square Garage (7th St. and Penn Ave). Pittsburgh Opera subscribers can buy parking vouchers for any or all performances for $9 each. These really come in handy when there’s a lot going on downtown because you're guaranteed a spot. To buy vouchers, call 412-281-0912. If you don't have vouchers in hand, you can get real-time parking availability at ParkPGH. The closest parking to CAPA is right across the street, in the garage at 9th and Penn. Parking is $6 after 5:00 PM. If the 9th and Penn Garage is full, you can get real-time parking availability at ParkPGH. Street parking is generally available on Penn Avenue, and there is a surface lot at 24th and Penn, right beside Harp & Fiddle ($8). If you don’t have time to enjoy our free Pre-Opera Talk one hour before each showtime, we suggest you arrive 30 - 45 minutes before the start time in order to find parking, find your seat, and settle in. If you arrive late, the ushers may need to seat you elsewhere until intermission. How can I learn more about the productions? We’ve got lots of ways to get you tuned in. Try the free Pre-Opera Talks with Kristin Gatch one hour before every curtain (except there's no Pre-Opera Talk for Glory Denied, at Pittsburgh Opera Headquarters). You'll hear the story of the opera, some background about the composer, and maybe some behind-the-scenes stories. Meet the Artists is after each Tuesday performance. Enjoy great coversation as the singers, conductor and General Director Christopher Hahn talk about the production and their experiences. You may be surprised to see how funny and down-to-earth these artists really are. Can’t wait until showtime? Then tune in to 89.3 FM or visit the WQED-FM website for WQED’s Pittsburgh Opera Preview Show. Gotta have the information right now? Check out the 2018-19 season page for the opera you’re interested in, and explore! You’ll find the story, music and video, cast biographies, and other features. If that’s still not enough, give us a call during office hours: 412-281-0912. Do you have services for people with visual impairments? Yes! Audio Description is available for people with visual impairments during Tuesday performances at all three of our performance venues. Using hearing devices, you can hear the supertitles read along with descriptions of the set, characters, and costumes. We also have Braille and large-print program summaries available. To arrange seating and take advantage of special pricing for Audio Description seats, call Regina Connolly ahead of time at 412-281-0912, ext. 213. For other accessibility information, click here. Where's the theater? Where's the Box Office? What about wheelchair access? Click the location links below for Google maps. The Benedum Center is Pittsburgh Opera's principal stage, at the corner of Penn Avenue & 7th Street in downtown Pittsburgh's Cultural District. • The Cultural District Box Office at Theater Square is at 665 Penn Avenue, downtown Pittsburgh. Phone: 412-456-6666. • The Benedum Center Box Office is located in the Benedum Center, just inside the lobby doors. It's open 2 hours before each production. CAPA Theater is located in Pittsburgh Creative & Performing Arts School, at the corner of Ft. Duquesne and 9th Street in downtown Pittsburgh. Pittsburgh Opera Headquarters in the Strip is between Penn and Liberty and between 24th and 25th streets. Click here for information about wheelchair access and other accessibility accommodations at all three of our performance locations. How can I bring a group? Groups of 6 or more are eligible for a group discount. We ask for a 20% non-refundable deposit, due within 2 weeks of booking. Final payment is due 30 days prior to the selected performance. A group’s ticket count may be changed until final payment is made. Although we will make every effort to seat groups together, it cannot be guaranteed and so we recommend making reservations as early as possible. After final payment is processed, tickets may not be refunded, returned, or exchanged. For more information, please contact groups@pittsburghopera.org. Can I bring a bag into the Benedum Center?